Carmageddon: Max Damage could have been fun, but low production values, terrible controls, spastic AI and a general lack of care make it an easy pass. The year was 1997, and gaming was enjoying one of its best calendars yet. Nintendo’s 64 and Sony’s PlayStation were duking it out for console supremacy, while PC gamers enjoyed treats of their own. In fact, 1997 will forever be known for being the release year for some of the most timeless games out there, including Final Fantasy VII, Goldeneye 007 and Mario Kart 64. Granted, those prominent and never-to-be-forgotten titles were joined by quite a few others of note, including Turok: Dinosaur Hunter, Star Fox 64, the original Grand Theft Auto and Carmageddon. Carmageddon, itself, is one of those games that has always carried with it a dubious reputation. Why? Well, its main bullet point was violence; that being the ability to run over and kill pedestrians in gory ways while racing other combatants. Hell, bonuses (in the form of time increases) were awarded for killing innocent civilians, or by maiming cows who wandered into the roadway. Needless to say, there were those who supported Carmageddon for its cartoony take on violence, and those who were against it — including countries like Germany and the UK, where the game was banned or censored. In the end, though, sales won out, as Stainless Games’ controversial effort nabbed them two million of them. Back then, my focus was on the Nintendo 64 and the few hours that I got to spend with my friend’s PlayStation. I was too young to really know about, or be into Carmageddon, and still haven’t played it to this day. Of course, I’d heard about the game and its sequels over the years since its release. I just simply never got around to playing them. When I read that Carmageddon: Max Damage was going to be coming to Xbox One and PlayStation 4, I jumped at the chance to check it out. After all, I’d heard so much about the games and wanted to see what all of the fuss was about. Unfortunately, that optimism was for naught, as my first introduction to the series has left a rather sour taste in my mouth. 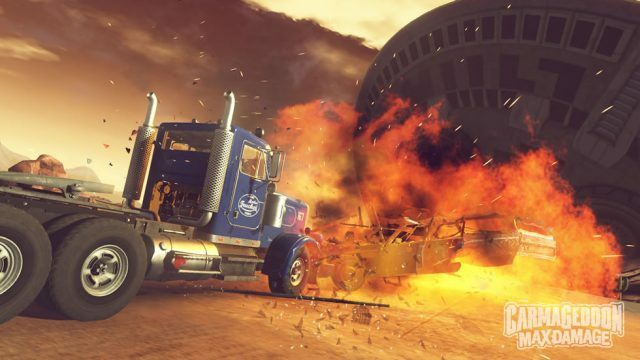 A takeoff from 2015’s PC exclusive, Carmageddon: Reincarnation, Max Damage comes to consoles as an update of an already released game. That’s kind of hard to believe, though, given how poor it plays and performs, and how little fun it actually is. If this is an update, I’d hate to play the original. Going in, I truly wanted to love this game. I’d heard the stories about its history, knew that it’d be a B-tier title, and set myself up for that. I’ve played and enjoyed these types of games in the past, and have always been one to try to recommend overlooked games to others, but that simply didn’t end up being the case here. After just a short period of time, I had almost had my fill, and have been pushing myself to keep going with it ever since. What’s so bad about this thing? Well, for starters, the vehicle controls make you feel like you’re driving on a stick of butter. There’s little traction, and trying for even the simplest turn can lead to a spinout due to some very floaty physics. As you can imagine, this is the recipe for a lot of frustration in a game that rewards you for being the first to hit a single highlighted pedestrian, get to checkpoints before others or run people over for a time boost. The good news is that Carmageddon: Max Damage manages without pinpoint controls, though they could’ve helped. After the umpteenth spin out, caused either by an attempt at a standard corner or right-hand turn, or an opponent driving into you like a drunken idiot, you’ll find yourself cursing the game. You’ll also do so when — after a couple of attempts to stop and turn on a dime in order to position yourself for a takeout of a walking civilian — a computerized opponent swoops in and takes the kill without much trouble. This is a frustrating game, and it does it to itself. Plus, it certainly doesn’t help that the AI fluctuates between braindead stupidity and flawless driving on a match by match basis. There was potential here, which is the most disappointing thing. The whole thing is just so lowbrow, and frankly so ugly — with graphics that feel generations old, glitches that can make the sky disappear, and character models that feel like they belong in Duke Nukem 3D — that it’s hard to recommend to anyone outside of the most diehard Carmageddon fans. Even upgradeable vehicles and online multiplayer don’t help, because the former makes little difference and the other is not only pedestrian free, but a ghost town as well. 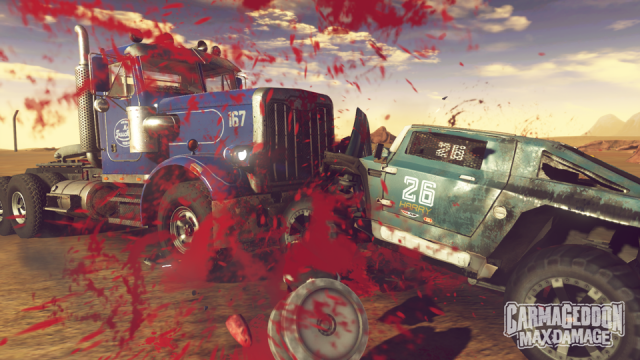 Skip Carmageddon: Max Damage and feel better for it. This is, frankly, a waste of both time and money. This review is based on the Xbox One version of the game, which we were provided with.